Nintendo's amiibo line has been a tremendous success for the company, bar the extremely overproduced Animal Crossing series that languished with great stock on store shelves before being severely reduced in price to clear stock. The original appeal of amiibo figures was not just to be able to collect cool Nintendo characters--many of which would never receive a figure of any type any other way--but it was also to add value in games with extra bonuses and features. However, Nintendo's latest use of amiibo with next month's Metroid: Samus Returns on the Nintendo 3DS seems to be taking the concept of locking content behind amiibo and doing so in a really scummy way to a good portion of fans. Has Nintendo gone too far with amiibo? And if so, is it worth boycotting Metroid: Samus Returns because of it? Amiibo debuted as a toy line as Nintendo's answer to other popular toys-to-life series like Activision's successful Skylanders and Disney's own Disney Infinity. However, while the toys from Activision and Disney's games were tied to one series of software, Nintendo's amiibo could be used for multiple games. 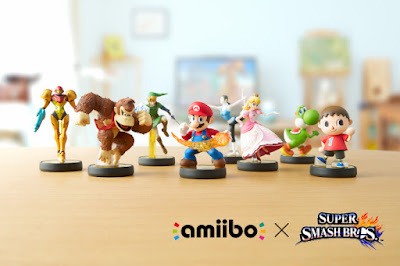 While the usage of amiibo hasn't as of yet been as deep as Skylanders or Disney Infinity, it has done small benefits for games like the first amiibo inclusion with Super Smash Bros. for Wii U and Nintendo 3DS, where custom character data could be saved to individual amiibo. Really, though, the fascination there was being able to collect various Smash Bros. fighters in figure form more than anything else. But then Nintendo moved on to cosmetic additions and small little bonuses. For instance, in Mario Kart 8 and later Mario Kart 8 Deluxe, specific amiibo could be used to unlock Mii costumes based off the character figures used. An issue that some had with this, and understandably so, was that while the costumes might be appealing to them, perhaps they didn't want to spend a $13 figure just for them, especially if they didn't care about collecting amiibo or displaying them at all. This was only further compounded by more games utilizing amiibo to unlock characters, bonuses, and other content. Why couldn't these additions just be DLC for people to purchase on the eShop, some wondered. While small bonuses that don't contribute much to games that utilize amiibo or aren't as desirable weren't too much to think of, things got especially heated with the release of The Legend of Zelda: Breath of the Wild for Nintendo Switch and Wii U. Scarcity of popular and most wanted amiibo was already an issue, and this concept was further compounded with the bonuses unlocked by The Legend of Zelda-related amiibo. New tunics for Link from past Zelda series adventures, rare weapons, and such were locked behind amiibo, and not just any amiibo, extremely rare, costly, and hard-to-find amiibo. Things have reached a boiling point for many with the news of the two Metroid: Samus Returns amiibo being required to unlock the most challenging difficulty in that game as well as content like playing as Samus Aran in the Fusion Suit. For old fogies like me (speaking in relation to how long I've been playing games and not so much how real world wisdom I have--which would be none), I remember when things like new modes and costumes were unlockables and rewards. Instead, now they're gated behind amiibo that will most likely be hard to find on store shelves. Man, I feel like busting out Archie and Edith Bunker's "Those Were the Days" right now, but with some modernization. And that's the big problem here--Nintendo isn't just doing DLC its own way, it's doing DLC in a despicable way. One should not have to buy a $10+ toy just to unlock modes and other desirable content. It's fine for collectors, but what about those who just want the content? The figures are a poor justification for something that should already be included in the game. Heck, Star Fox Zero, as maligned as that game often is, did the amiibo right. Yes, you could use a Fox or Falco amiibo to immediately unlock a cool reward, but you could also play the game normally and unlock it that way. The latter would take longer, but you could still do it. Instead, Nintendo has moved away from that logical and defensible take on amiibo and doubled down on their shady practice. It's highly disconcerting and very disappointing. 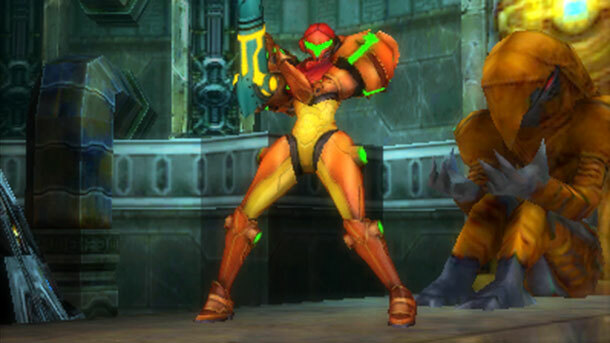 Now, I'm harsh here on Nintendo's use of amiibo, but does that mean that one should boycott Metroid: Samus Returns and any future game that uses amiibo in an unflattering way? I don't think so. If the game appeals to you, and it seems like it's going to be a truly stellar title, then I think one should still buy it. Heck, buy it used if you're so willing to do so, but showing support for the Metroid series after so many years of absence from the franchise would be a good thing if you love the franchise. If you don't love the use of amiibo, don't support that--as in don't support the amiibo. Don't buy them; don't think about buying them. Metroid: Samus Returns will still be an enjoyable game without the bonus content included. 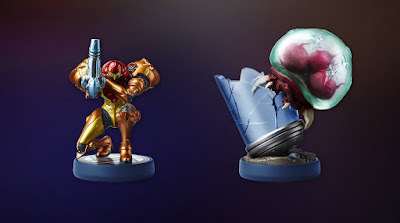 Yes, it's really crappy that Nintendo went this direction with amiibo in Samus Aran's glorious return to gaming, but I don't believe denying yourself the ability to play the game and support a franchise you love is sending the right message to Nintendo quite like what avoiding buying the amiibo would instead. Three classic games in one?! That's... That's... no, "crazy" isn't the word I'm looking for. What's the word...? Hmm... I'll have to get back to you guys on this one. Can you believe that it's August already? The first day of a new month routinely brings a new Review Round-Up onto SuperPhillip Central, and that's the case on today, August 1st, as well! Five reviews were posted for the month of July, so let's reminisce! 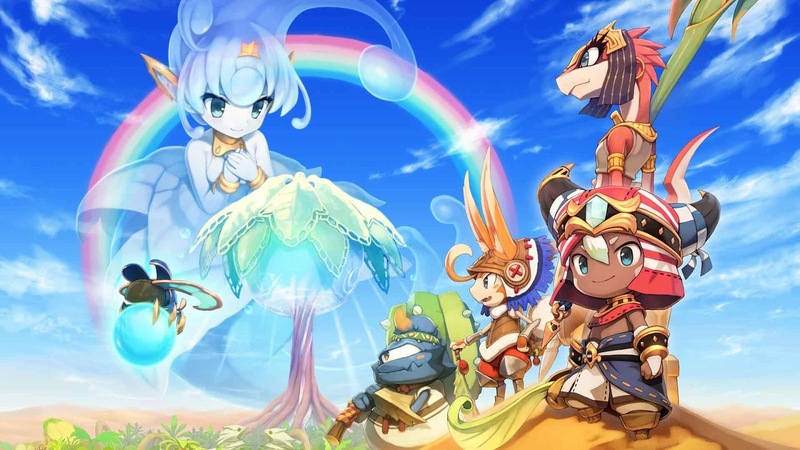 The month started with Ever Oasis from Grezzo, the team behind the remakes of The Legend of Zelda: Ocarina of Time 3D and Majora's Mask 3D. This original Nintendo 3DS game from them was truly remarkable, earning it a B+ grade. 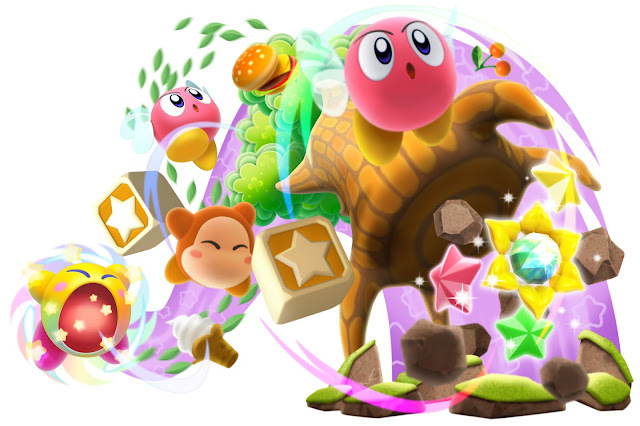 Then, we moved on to celebrate Kirby's 25th anniversary year with a duo of Nintendo 3DS eShop games, Kirby's Blowout Blast (B-) and Team Kirby Clash Deluxe (C+). Moving from the Nintendo 3DS to the Nintendo Switch, Taiwanese developer Rayark's Implosion: Never Lose Hope seriously impressed this reviewer with its satisfying hack and slash action and notable production values, so I gave it a B+. Rounding out the month of this relatively smaller-than-average amount of reviews, Bean gave us a rare review, this time checking out the recently released Crash Bandicoot: N. Sane Trilogy. He awarded the game an A- score. That's approximately 9 "Woahs" out of 10, if you're interested in that sort of thing. Here's to August, where SuperPhillip Central will keep the summer reviews coming! Unlike grains of sand, don't let Ever Oasis slip through your fingers. It's a terrific game. For the final review of July on this final day of July, we have a SuperPhillip Central review from Bean, who we haven't seen for a while. This is his review from his full play-through of all of the games featured in the Crash Bandicoot: N. Sane Trilogy for the PlayStation 4. 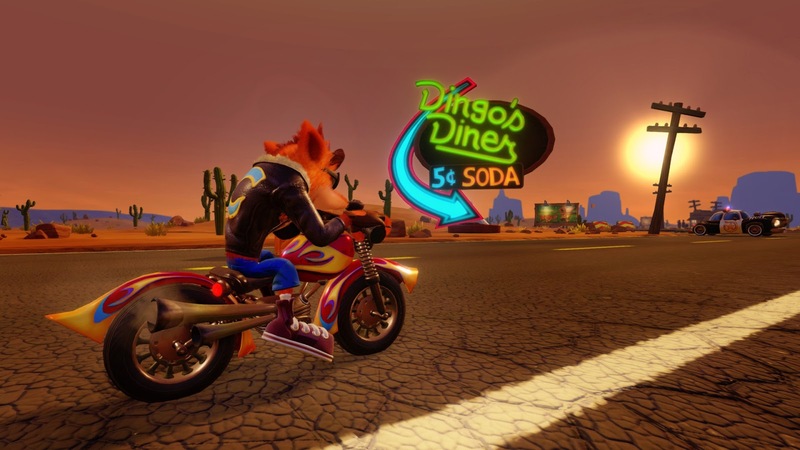 Crash Bandicoot originally raced on to the scene twenty years ago on the original PlayStation console. It was the story about an Aussie animal that was given sentience thanks to a pair of sinister scientists, Dr. Neo Cortex and Dr. Nitrus Brio, in their plot to take over the world using an armada of mutated minions. Crash escaped, but his girlfriend didn't, so he wound up going on an adventure to get back to the lab and save the day. He did and wound up starring in two critically and financially successful sequels before licensing issues would take him from top tier mascot to looking like he was a John Cena cosplayer. 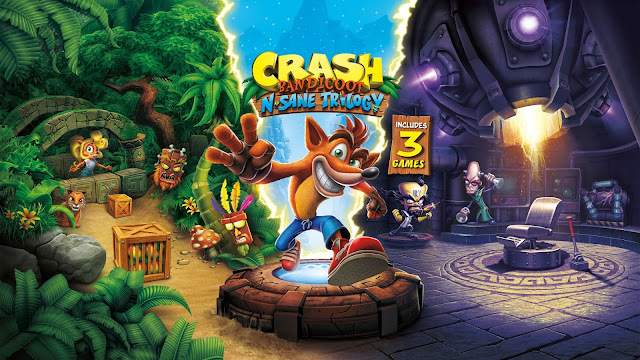 Activision, who had gained the Crash license through their merger with Vivendi, saw the fan interest in bringing the Bandicoot back to his prime old self and put Vicarious Visions on the job to remaster the popular PlayStation trilogy with the N. Sane Trilogy for the PS4. I'll say right now that the company did a very faithful, even if not totally accurate job at remaking these classics... for better or worse as you'll find out. 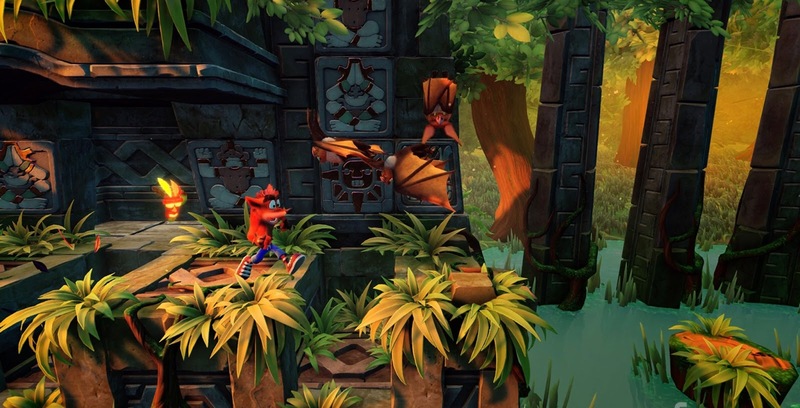 Crash Bandicoot shows us his fantastic Indiana Jones impression. The goal in all three Crash Bandicoot games is to run and jump your way through stages while breaking every box along the way both in the main levels and usually a bonus path to find inside said levels these to earn yourself a gem at the end. In the original Crash Bandicoot, these were the only collectibles to worry about. However, what made them so hard to get in the original and not the sequels was that when you lost a life even after breaking open a checkpoint box, every crate would be back and unbroken. This meant you had to do a no-death run of every stage just to earn a gem, and that wasn't the easiest task in the world back in the day. In this remaster, the game has mercifully been toned down as you can now go through and die at checkpoints as much as you want... unless you're going for one of the game's rare colored gems. Those levels still require you to do a no-death run of the whole stage in one try lest you be rewarded with a screen that tells you that you were almost perfect except that you died. Ouch. One of the most frustrating things with the remaster is that the original source code was apparently lost. This means that physics were changed up in spots. In Crash 1's case, this is definitely to the disadvantage of the player as Crash does not get as much air on his jumps, and therefore, does not get the same distance on them either. Couple that with shadows that aren't as pronounced, and you have one-third of a remake where it's both tougher to gauge and land your jumps correctly. Even worse, physics issues will also pop up if you land on the edges of platforms. Things that could be easily done in the original, like running on ropes in the infamous bridge levels, now are nail-biting exercises in frustration. Yes, I was able to get through these stages fine without resorting to this tactic, but it never feels right to be safely on a platform only to find yourself running forward and be pushed off into the abyss. On the positive side of things, this is the only part of the trilogy where I felt things were off, but you still take a game I thought was mediocre for one reason and keep it that way for another. No matter the dangers, Crash always rushes onto the scene! But that all changes the moment Crash 2 begins. The point-to-point world map system is dropped in favor of small hubs that have five portals for quick access. Crash himself gets a few new moves like the ability to do both long and high jumps with a combination of pressing circle (or R1) and X. 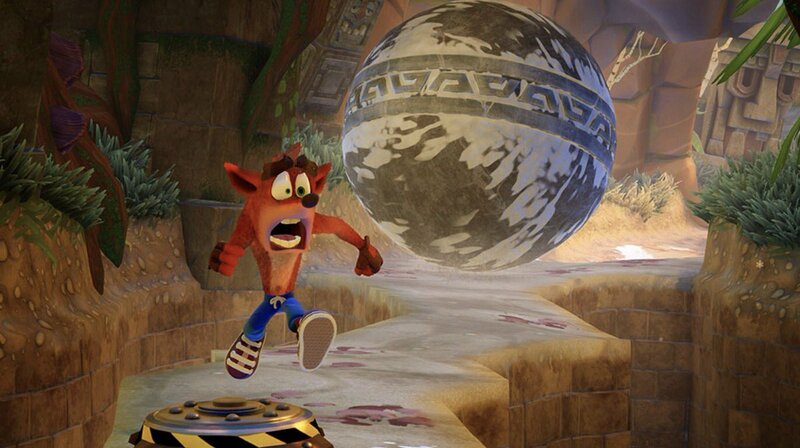 Even better, if the player presses Square to spin immediately after doing one of these two types of jumps, Crash will either get more distance or height on his leaps. Knowledge of all of these moves are required to get both gems and the newly-added crystals. 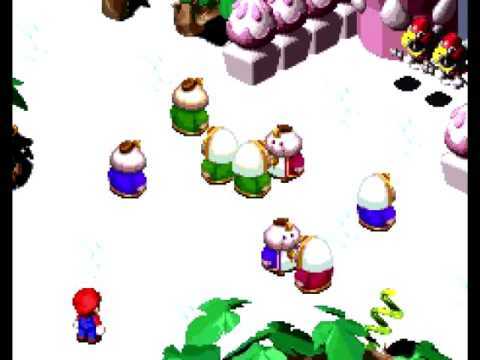 The crystals themselves are the main collectable to make progress in this game and will usually be right out in the open in the second half of levels. Other additions in this one include alternate paths, secret exits, and a couple of non-platforming vehicle stages. Levels where you're rushing towards the camera can take a little getting used to and require some memorization. I'm a fan of the Death Routes which are alternate levels that the player must once again reach by not dying in the level up until that point. 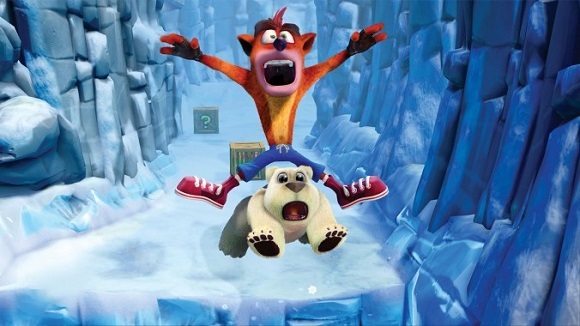 These areas usually offer a higher degree of skill to complete, and in one specific case, Crash will be forced to slip and slide through an icy chamber to hit a switch only to be forced to go all the way back to the start to be able to break every box in the stage. Oh, and did I mention this area is filled to the brim with Nitro Boxes, green crates that explode the moment you come into contact with them? Yes, this game expects a lot from the player and the backtracking in some levels can go overboard at times, but it's pure platforming fun and my favorite entry of the trilogy. Crash 3 or Warped, depending on which part of the world you're from, continued to add to the Bandicoot's arsenal when you beat bosses as you'll earn new special abilities like a double jump or glide spin to once again make it through levels easier. It also added Crash's sister, Coco, as a playable character originally although she is playable in all three titles in the N. Sane Trilogy thanks to Vicarious Visions. Unfortunately, while Warped has some of the best platforming stages in the entire trilogy, it also goes overboard in terms of its gimmick levels. 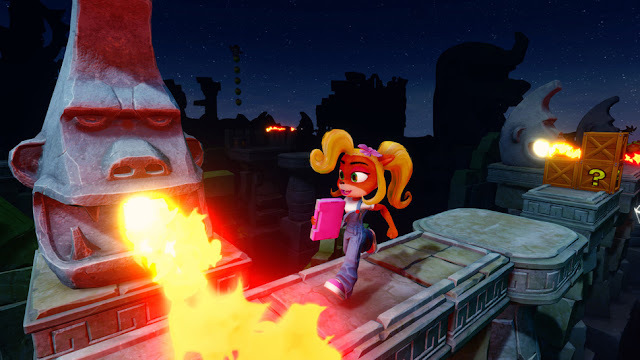 This time around, no matter the game, Crash's sister Coco is available to play as. I mentioned Crash 2's vehicle stages, but they weren't as prominent as they are here. This game throws them in early and often. Jet ski tracks, motorcycle races where you have to get 1st, airplane dogfight stages where you have to shoot down blimps, a couple of swimming stages. You have all of these new moves at your disposal, yet it feels like more than a third of the game takes you out of platforming and throws you into these kind of levels. It's a bit frustrating, but it's not a total dealbreaker, although I will say the jet ski levels feel a little more loose or tight depending on what kind of turn you're trying to make. It's still a fun game overall, but the final part of the trilogy could've been the best instead of a step down from its more fun predecessor thanks to these abundant and unnecessary gimmick stages. The majority of Warped's levels have various gimmicks to them, for better or worse. The final new addition in Crash 3 were relic race time trials. In these, you would hit a stopwatch at the beginning of the stage and go through levels as fast as you can. Certain boxes would be converted into a yellow color with a number on them from 1-3. Break those boxes, and the clock would stop for that amount of time as you kept going along. Sapphire, Gold, or Platinum Relics would be handed out depending on how fast you were... pending you were fast enough to earn one in the first place, that is. Vicarious Visions knew players enjoyed this and decided to also add these time trials into the first two titles as extras for trophy goals. Once again, they really don't feel right in Crash 1, but once you beat the final boss in Crash 2 and earn a Speed Shoes upgrade for faster movement with the press of the R2 button, it feels great. Your jumps again go farther with this active, so you might as well get your inner-Sonic on and race to the finish! Another obvious but necessary inclusion is the ability to save anywhere on the map or in hubs in all three games. It's just a shame the load times when going into the game or stages last a bit longer than I'd like to see. Crash gives this boss encounter a spin and seems to be succeeding. 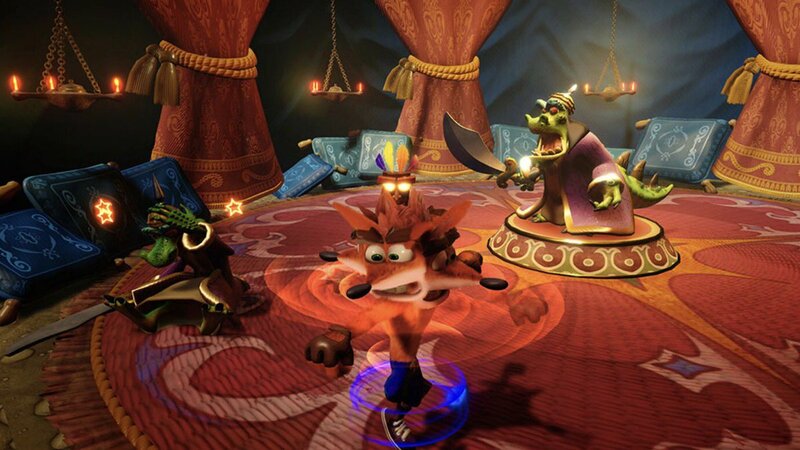 Still, the whole N.Sane Trilogy does a faithful job of recreating two very fun games and the original Crash as best they could be in terms of both upgraded visuals and sound. I had a fun time going through these titles again this month for the most part, and really, a compilation set like this for the Bandicoot's 20th Anniversary is a no-brainer for any and all Crash fans to pick up. With its successful debut worldwide, who knows if this will lead either to a new entry in the series or perhaps another compilation set with a certain purple dragon? 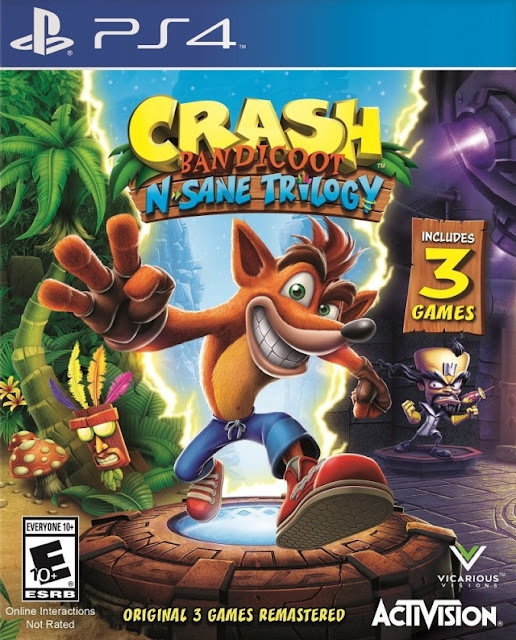 It's absolutely N. Sane that it took this long for the series to go back to its roots, but I'm definitely glad it did. On this final day of July, SuperPhillip Central's Favorite VGMs greets us with a new installment, a platformer-filled edition! Be it games that are purely platformers or one that feature characters famous for their platforming antics. Okay, that's enough of the word "platform" or any variation of it because I've already use the word too much in this opening paragraph! We begin with a game that will soon reach the Nintendo Switch with Rayman Legends. Moving on from that limbless wonder we turn a pink gluttonous blob with Kirby: Triple Deluxe. Mario is featured next, but not in a traditional platforming (dammit, I can't stop using the word!) role. Instead, we see him in his first RPG ever with Super Mario RPG: Legend of the Seven Stars. Finally, two PlayStation platformers, one modern with Puppeteer and one classic with Jumping Flash! rounds out this edition. Click on the VGM volume name to hear that song. Click on the VGM Database to see and hear any past VGM volume featured on this weekly SuperPhillip Central segment. Now, let's get on to the music! As I stated in the opening, Rayman Legends is coming to yet another platform! This time around it's the Nintendo Switch which is being deemed by Ubisoft as the Definitive Edition. Almost everything about Rayman Legends is satisfying and stupendous, like the level design, tight platforming, amount of content, and of course, the music! So good! But I did say almost everything. 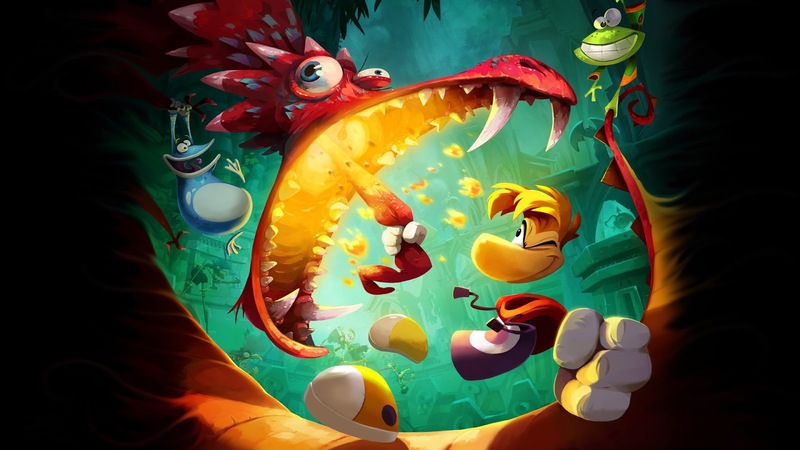 What wasn't so terrific about Rayman Legends? Well, to some, the Murfy levels, but for me, that really awful special series of levels at the end of the game. Yes, Kirby is our gluttonous hero, but no matter his craving and insatiable appetite, we'll always have a fondness for him, now won't we, ladies and gentlemen! In his first Nintendo 3DS outing, Kirby could transform into an ultra powerful version with tremendous suction power, able to open his massive mouth up wide and inhale enemies both small and large as if they were nothing. He could even move gigantic objects to solve environmental puzzles. This was the theme that played during these action-packed gameplay segments in a Nintendo 3DS adventure that many Kirby fans adored. v1438. Super Mario RPG: Legend of the Seven Stars (SNES) - Let's Do the Fooka-Fooka! Moving from one Nintendo platforming all-star to another, though admittedly a much more popular one by far, we have Mario's first RPG adventure with Super Mario RPG: Legend of the Seven Stars. It would be the last project then-Squaresoft would make for a Nintendo system until the GameCube's Final Fantasy Crystal Chronicles and the Game Boy Advance's Final Fantasy Tactics Advance. Let's Do the Fooka-Fooka! plays in Nimbus Land, the home of Mallow, who--SPOILER ALERT!--isn't actually a tadpole. He's a cloud, and the prince of Nimbus Land at that! 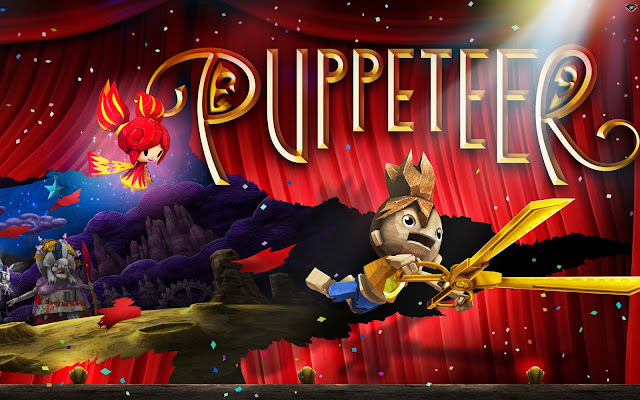 The severely underrated Puppeteer for the PlayStation 3 released late in the console's life. This was the same season the PlayStation 4 launched, taking a lot of attention away from the PS3 lineup that year. Puppeteer sports and insanely whimsical and jaunty orchestral soundtrack that really makes you feel you're in a part of a seriously wonderful adventure. And you ARE! Puppeteer's play-like presentation is only boosted by Patrick Doyle's impressive score. Jumping Flash! might not be a household name by any stretch of the imagination, but not only was it an early example of 3D platformer, but it was an early example of a 3D platformer done right. As the main character you launched into the air, leaping with high velocity to progress through environments. 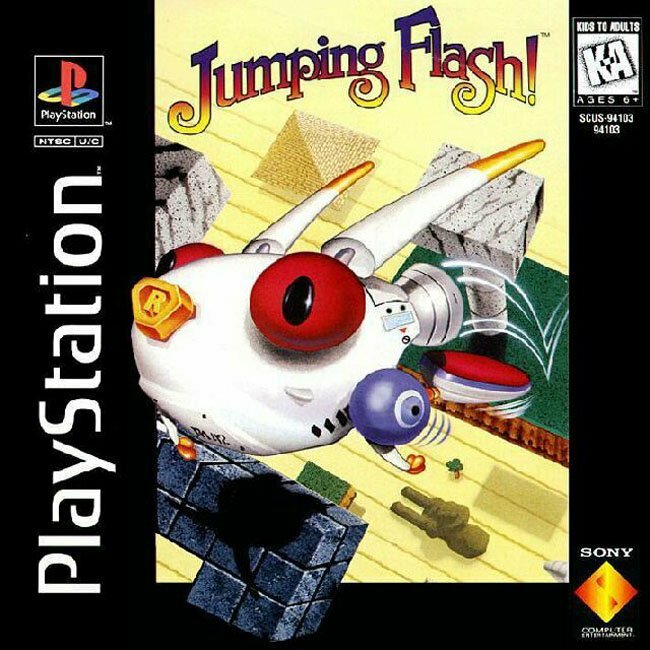 Beyond the sublime gameplay, Jumping Flash! sported a cheery and jovial soundtrack as well. Sadly, the composer behind the game's music, Takeo Miratsu, passed away in 2006 due to liver cancer. His spirit most definitely lives on in his music, whether in Jumping Flash! and its sequel, in Legend of Dragoon, or in the Beatmania IIDX series of games which he contributed regularly to. September is going to be quite a busy month for Nintendo 3DS owners. With Metroid: Samus Returns already due to release on September 15th, Nintendo and Capcom have announced a September 8th release date for Monster Hunter Stories, a new take on the long running Monster Hunter franchise. In addition to that release date announcement, Yokai Watch 2: Psychic Specters is coming to both North America and Europe on September 29th. What a month of releases! Rounding out the weekend (but not this month of reviews) is an indie game previously released on mobile devices in 2015, now available on the Nintendo Switch as of this past month. It's Implosion: Never Lose Hope. I've grown to admire mobile gaming a lot by understanding that the majority of games put on Apple and Google's marketplaces are not those riddled with ads, ways to manipulate the player into spending massive amounts of money, or loaded with gacha elements. There are some truly fine games on the mobile market, and more impressive is the fact that traditional gaming experiences can play and do well on smartphones and tablets. 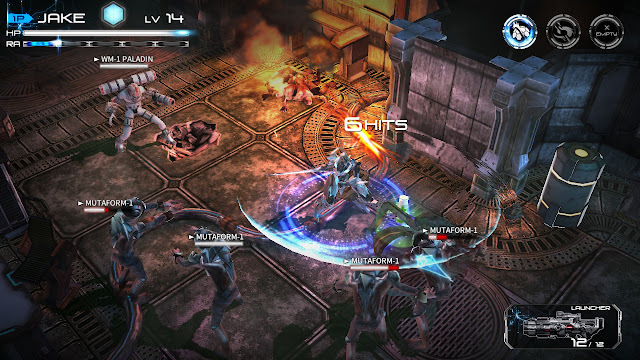 One such game comes from Taiwanese studio Rayark, who delivered a skill-based, action-intensive hack and slash game with Implosion: Never Lose Hope. Now the game has been ported to a home console for the first time with this Nintendo Switch version. My fear going into the game was that it wouldn't be properly appropriated for the Switch hardware. Thankfully, this fear was for naught, as Implosion: Never Lose Hope on Nintendo Switch is a fantastic indie game. The first thing that I noticed playing the game was that for the small budget that Rayark had to work with, Implosion's production values are seriously impressive, featuring fully voiced dialogue, smooth visuals, and lots of action happening on screen at once. The latter, however, causes for some frame-rate issues and on some occasions even second-long moments of freezing. While the action is fast and fluid for the most part, with Rayark's budget, the visuals themselves are definitely a bit of a generation behind in quality. This is hardly noticeable in handheld Nintendo Switch form, but it's quite pronounced on the big screen. Still, I couldn't help but be delighted by the development team's work with Implosion's presentation. Environments have adequate detail, but things can slow down when the action heats up. Mobile games that are converted to consoles don't always fare well in the control department. This is a non-issue with Implosion, where I can happily say that the controls in the Switch version are extremely tight and responsive. I needed those controls to be extremely tight and responsive because not being able to properly slash away at enemies from all angles and narrowly avoid enemy attacks with a well-timed evasive boost would make the exciting prospects of Implosion, well, implode. When you're too lazy to just run up and melee a foe, blast 'em to smithereens instead. At first, you're effortlessly mowing down mutants and zombie-like creatures with ease, but as you progress through Implosion's four chapters, the enemy variety, types, and combinations increase and become all the more challenging. Simple button mashing will lead you nowhere but a swift death in later levels. Instead, you need to carefully concentrate and watch enemy behaviors and their tells when they're about to attack, as well as master switching between your blade and your ballistic arsenal. This is all the while keeping an eye on your suit's shield. Once it's gone, any damage you sustain will hurt your suit, and once that health bar is depleted, your suit falls to the ground, requiring you to revive it on the spot. Fortunately, if you can avoid damage for a little while, your suit's shield will auto-replenish. This is paramount for when you want to beat levels without taking any damage. Be careful not to get any mutant blood on your suit's shiny coat of paint! Why would you want to do that task, you ask? 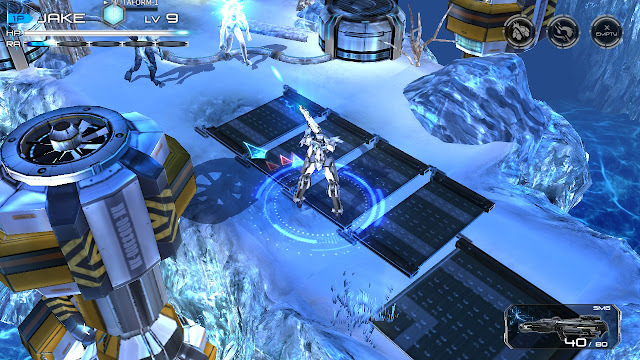 Implosion features a badge system that has side goals to complete in each level. These range from breaking all of the containers in a level to not allowing your suit to get knocked to the floor, among many other things. For completing a given side goal, you earn a badge. These add to your overall total, unlocking equipment like enhancements, new suits, new armor types, and special weapons. Between getting all of the badges in the normal, hard, and expert difficulties in addition to the bonus levels in the game, Implosion has a lot of meat to it to keep players engaged for a lengthy amount of time. That certainly happened with me, as long after I finished the main story and saw the credits I immediately jumped into the hard difficulty where a new set of badges to earn and accrue awaited me. Speaking of enhancements, sprinkled around levels, dropped by enemies, found in chests, and so forth, are digital cubes that unlock new gear that can be equipped to your suit. These can increase your suit's stats by varying amounts. Different stats include power, armor, shield, shield recovery, speed, experience and currency bonuses, and more. One thing that I didn't like about this system is that the game doesn't provide any kind of tutorial to teach the basics of how it works. It's somewhat intuitive enough to get the basics of, but some advice and guidance overall would have been greatly appreciated. Implosion offers enough challenge to keep veterans gamers engaged while also being accessible enough for mainstream audiences. It certainly has the right amount of spectacle to appeal to both groups, whether it's with the missions themselves or the end-of-chapter boss battles that are indeed really crazy and intense. It's a type of game that has a lot to offer for most types of players. You know what they say--"the bigger they are", and all that. 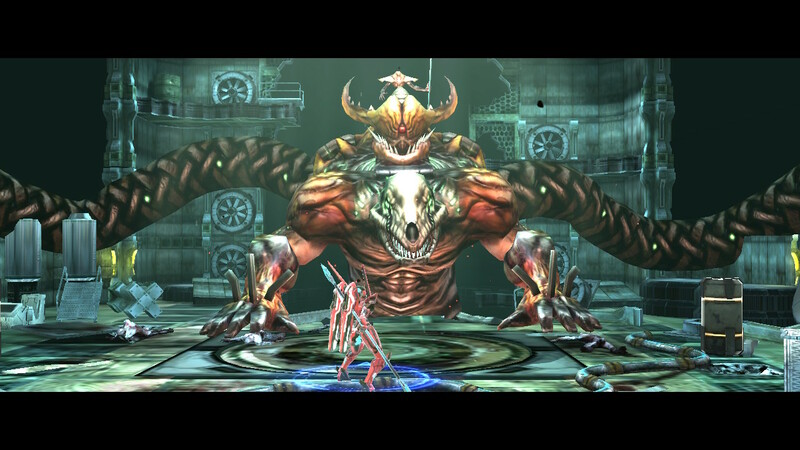 If I could compare Implosion: Never Lose Hope to other games, and do so favorably, I would center in on games like Devil May Cry, Onimusha, and various titles released by Platinum Games. 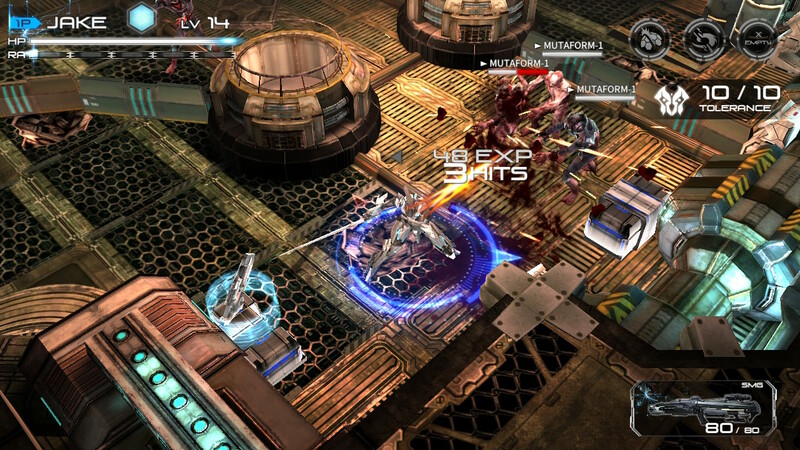 Sure, Implosion is nowhere in the same league as the aforementioned genre titans, but for its budget, for its price, and for its size, Implosion: Never Lose Hope is an arcade action-style hack and slash game that is one of the best indie offerings on the Nintendo Switch yet, and just a sweet damn gaming package all to itself.